Tourism, Travel, & Information Guide to the Province of Guadalcanal in the Solomon Islands. - Area total: 5,302 km². 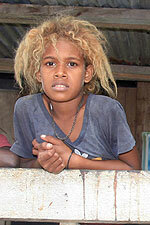 - Population: Solomon Islands: approx. 477,000. Honiara: approx. 68,000. The ancient and archeologically significant city of Cajamarca is the capital of this region of Peru. Historical Talca is the capital city of Chile's Maule Region. Guadalcanal is the largest island in the Solomon Islands, the third largest archipelago in the South Pacific, with 992 islands and a total area of 28,450 square kilometers. The capital of the Solomon Islands, Honiara, a picturesque seaport with a population of 54,600, is located on the northern coast of Guadalcanal. Guadalcanal is well-known for its pivotal role in World War II, with the Battle of Guadalcanal turning the tide in favor of the Allies in the Pacific theater. 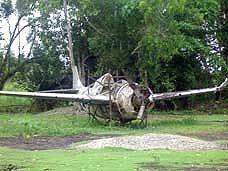 Guadalcanal today is still filled with many World War II relics and monuments. Learn more about the importance of Guadalcanal in World War II. 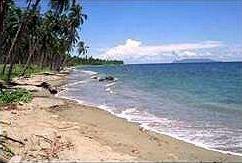 Guadalcanal is a tropical island with an average temperature of 29 °C and high humidity. Guadalcanal's wet season runs from November to May. At this time of year, the island is more prone to experiencing cyclones. On April 1, 2007, a magnitude 8.0 earthquake occurred about 215 miles west north west of Honiara. A tsunami hit the Solomon Islands, killing at least 40 people, leaving many others missing, and destroying several villages. 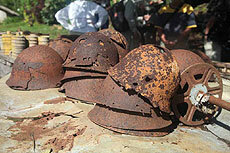 About 300 homes, schools, and a hospital were destroyed in the Solomon Islands city of Sasamunga in Choiseul Province. The western and eastern coasts of Guadalcanal were the sites of many World War II battles. 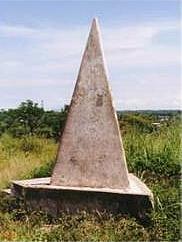 Many of these sites have war relics, monuments, and memorials. The northern coast is the heart of the province, whereas the southern coast, called the "weather coast" because of heavy rainfall, is host to small villages and is less accessible. The Solomon Islands have been inhabited for thousands of years, initially by settlers from New Guinea. The islands were named by a Spanish explorer, Alvaro de Mendaña de Neira, who, on finding alluvial gold on Guadalcanal in 1568, believed he had found the biblical King Solomon's source of gold. For two hundred years after this, there were few visits to the island by Europeans. Then, in the 1800's the British took an interest in the islands. A trade in laborers began, with workers from the Solomon Islands being taken sometimes brutally to Fiji and Australia to work on sugar plantations. The British created the Western Pacific High Commission in Fiji in 1877, to protect British interests and British subjects in the Solomons. 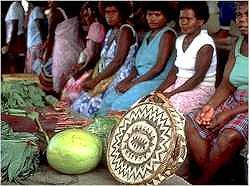 Germany also took an interest in the Solomon Islands during the late 1800's. Britain and Germany both vied for control of these islands and eventually divided them. The northernmost island, Bougainville, became part of the German islands of New Guinea, and then a province of independent Papua New Guinea. The rest of the Solomon Island chain became a British Protectorate in 1893. In the last years of the century, more islands were added to the British Protectorate of the Solomon Islands. In 1900, Germany transferred the islands they had controlled to Britain. 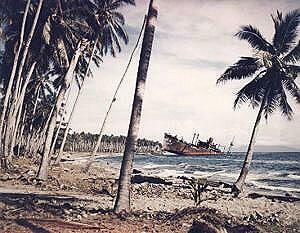 The island of Guadalcanal was the scene of a pivotal battle when it was invaded by the Japanese in World War II. Read more about the Battle of Guadalcanal here. After the war, in 1945, the British regained control of the Solomon Islands. In 1976, the islands became self-governing. They gained independence in 1978. In 1999, a militia group made up of people from the Isatabus tribe on Guadalcanal, called the Isatabu Freedom Movement, began to expel people from the nearby island of Malaita. The Isatabus had become resentful of the Malaitans, who moved to Guadalcanal and obtained jobs in Honiara. In response, a Malaitan militia was formed, called the Malaita Eagle Force. Using stolen police weapons, the Malaita Eagle Force ousted Prime Minister Bartholomew Ulufa'alu in June, 2000, and seized control of the capital. The rival militias signed the Townsville Peace Agreement in October 2000, but lawlessness persisted. In July 2003, the prime minister requested intervention by an international peacekeeping force. Australia led this force, and on August 13, 2003, the Isatabu Free Movement leader, Harold Keke, surrendered to the peacekeepers. Since then, the country has been relatively stable, although in April, 2006, rioting took place after Snyder Rini was appointed prime minister. Opponents claimed that Rini was beholden to Chinese interests and forced him to resign 8 days later. The parliament then elected opposition candidate, Manasseh Sogavare, to be the prime minister. 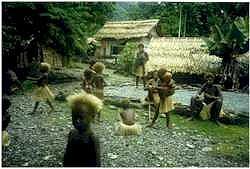 Some Solomon Islanders maintain a traditional lifestyle in small villages around the island. Some maintain traditional religious beliefs or a combination of these beliefs and Christianity, which was taught by missionaries who began arriving in the late 1800's. These traditional beliefs were passed to the five clans, which came from each of the five sons of the heroine, Koevasi, who is believed to have created the first humans. Each clan has spirits of the dead, shark spirits, and snake spirits. Each of these spirits is believed to possess nanama, a supernatural power that they can wield over the living. Practitioners pray to each spirit for different purposes. For example, they pray to the shark spirits for issues related to fishing. Priests guide clan members in sacrifices and divinations, but other clan members can cast spells. In the traditional religion, believers hold feasts for weddings, funerals, births, and the completion of new homes. The afterlife is important, and practitioners pray to deceased ancestors in the belief that they can intervene on behalf of the living through nanama. Malaria is endemic to the Solomon Islands. Yellow fever is another disease of concern, also transmitted by mosquitos. Travelers should consult a physician before traveling to Guadalcanal. Guadalcanal is known as a top diving spot, with clear water and a rich array of wildlife, as well as shipwrecks to explore. The island is also a wildlife and bird watcher's paradise, where over 200 species of birds can be seen. Many tourists also come to Guadalcanal to visit World War II battle sites and museums and take in the culture of the island at traditional performances. - A cultural treat awaits at the Mendana Hotel in Honiara, which hosts weekly panpipe performances. - The National Museum is located across from the Mendana Hotel, and contains traditional handicrafts and historical artefacts. - A variety of traditional architectural styles of the Solomon Islands are on display at the Cultural Centre behind the museum. - The former Old Government House is now the National Art Gallery and offers painting exhibitions. - The National Archives contain the most extensive collection of historic information in the Solomon Islands. Located next to the National Museum, the National Archives are open to the public. - The Botanical Gardens, located near the Solomon Islands Broadcasting Corporation (SIBC) studios (through the Rove prison gate and down the road), have collections of orchids and tropical plants as well as an herbarium. Visitors interested in the military history of Guadalcanal can take guided tours of historic sites from the Battle of Guadalcanal, including Bloody Ridge, Henderson Field (now the Solomon's international airport), Mataniko River, Red Beach, and the Western and Eastern Battlefields. The Battle of Guadalcanal was featured in the recent film "The Thin Red Line", which was filmed partly on Guadalcanal. 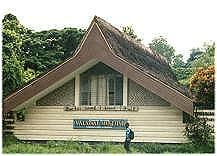 The Vilu War Museum, 25 km west of Honiara, is home to both US and Japanese artefacts. Tourists can dive and snorkel in the clear, warm waters where a variety of marine life live, including barracuda, trevally, lion fish, giant clams, hammerhead sharks, and whale sharks. One popular dive spot is Bonegi Beach, a few miles west of Honiara. 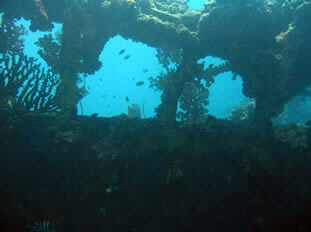 A dive spot where military relics can be explored is Iron Bottom Sound. Divers can explore sunken battleships, including the Bonegi I and II, and aircraft, incling B17 bomber wrecks. 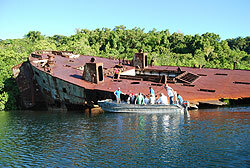 One famous recent wreck is the world Discoverer cruise ship, which ran aground on a reef in 2001. Snorkelers can enjoy a coral reef called Marau Sound, which is home to tropical fish, giant clams, and rare sea shells. Tourists can enjoy many other water sports on Guadalcanal, including sea kayaking, yachting, sailing, and canoeing on sheltered waterways. At the Betikama High School, outside Honiara, tourists can see and purchase handicrafts, including wood carvings, trays, shell jewelry, ebony carvings, pottery, and WWII relics. Guadalacanal offers excellent opportunities for hikers and bird watchers. 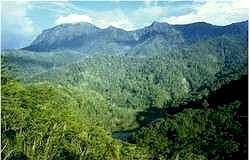 Hikers can see turtles, flying foxes, and many birds, including white-eyes, rails, honeyeaters, fantails, coucal (the world's largest cuckoo), thrushes, and megapodes (birds that lays eggs in volcanic sands and whose chicks can fly right after digging themselves out). In addition, there are several stunning waterfalls to visit, including Mataniko Falls, which is a two-hour walk from Honiara. There, the waterfall pours over a cave with resident bats and swallows. The Tenaru Falls, a 60 meter waterfall is another spectacular site and is a day's drive and trek east of Honiara. Cycling, golf, and spelunking (cave exploration) are a few of the other outdoor activites visitors can enjoy on Guadalcanal. Tourists are welcome to visit the Giant Clam farm, 22 km west of Honiara. This farm was established in 1988. The main airport in the Solomon Islands is Henderson International Airport, 8 km outside Honiara, on Guadalcanal. Solomon Airlines flies into this airport from cities around the South Pacific, including Brisbane, Australia, Auckland, New Zealand, and Nadi, Fiji. Solomon Airlines also serves several Asian cities, including Bangkok, Thailand, Bombay, India, and Jakarta, Indonesia. There are a few boats (mostly diving charters) that include cruises to Guadalcanal and other South Pacific Islands from Nadi, Fiji and Cairns, Australia. We will list them here shortly. Honiara has car rental facilities, including rentals at the airport. Taxis and minibuses are also available in Honiara. For island hopping, Solomon Airlines offers many flights and several tour operators offer domestic cruises. Use HONIARA as your destination city and compare the travel services. Valor Tours, Ltd. is a resource for veterans, their families, military service organizations, unit associations, reunion groups, historical societies and government institutions with an interest in the Pacific and Europe wartime theaters. Today, tour participants are largely veterans' sons, daughters, grandchildren and the general public, especially WWII history buffs, seeking a meaningful focus for their vacation travels. Check out the website for all the details! See the coral reefs, colorful sea life, and World War II wrecks. Do you own a hotel or other business in Guadalcanal that caters to tourists? Grow your business by advertising on Guadalcanal.com. For information on our excellent rates, contact us today. Guadalcanal.com is currently seeking royalty-free images of the city, region, and people of Guadalcanal for use on this website. Some images on this website have come from other internet sites. The policy of Guadalcanal.com is to attempt to contact the person or organization that owns the copyright to these images to request their permission to use the images. Guadalcanal.com also links to the websites on which images were found. Please contact us if you have any concerns or comments about any images used on this site or if you can provide additional royalty-free images for Guadalcanal.com. © 2007-2018 Guadalcanal.com. All rights reserved.